Are Custom Pews for You? Most churches make a decision about church pews only once or twice in a century, so it can be difficult to feel confident about that decision. One of the first questions is, does your church want custom pews? Some church pew companies, like ours, make each piece of church furniture to order while others have stock they send out as needed. What’s the difference? It comes down to quality, attention to detail, and customizability. Born Again Pews custom pews are made with your church in mind and no one else’s. When you work with us, we design your custom pews to your specifications and needs and then build them out of high quality materials made to last. Since we make every order by hand once the order is placed, we can focus our attention on the little details of the furniture. Every joint, nail, and piece of wood is well taken care of during our process because we focus on quality rather than quantity. Instead of churning out as many as we can, we want to do the best job possible. After all, we’re on a mission to help spread the Word and doing a shoddy job of it wouldn’t help us be good servants of the Lord. You won’t find that same attention to detail from big companies with different intentions. Our custom pew ends are made with solid wood—not veneers or other questionable wood products. 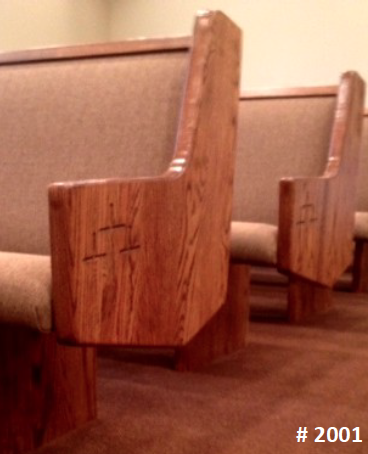 The seats of our custom pews are made with premium quality plywood, never particle board. We focus on selecting the best pieces for our furniture too—not just using whatever is the cheapest. Knotted wood that will crack and fall apart isn’t what you’ll find in our church pew ends. Instead, you’ll get beautifully grained pieces of wood that are made to last. When you are pricing church furniture, ask about the company’s processes. Do they make the church furniture to order or do they slap together what you need in an assembly line of pre-made pieces? If you want something special, unique and of high quality, that just isn’t going to work. 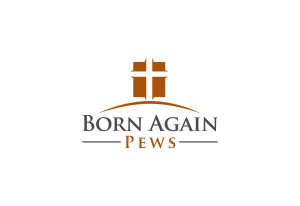 Instead, get a free quote from us and see the Born Again Pews difference.